Three of the older houses in Thornbury; Porch House, Clematis Cottage and The Priory were owned by the same families as part of a single estate at various times in their history. A close examination of a map will explain why this is so. They are all situated on the western side of Castle Street on land between Latteridge Lane and Kington Road that was referred to in some earlier records as “Latteridge” and “The Green House Closes.” The deeds of Clematis Cottage clearly state that that house was formerly known as “The Green House.” We believe the “Green House Closes” is therefore a reference to land originally associated with the Green House, a building that later became Clematis Cottage and The Priory. Click here to see more about the structure of Porch House. Although we have not researched this early part of the Thornbury’s history at all we have been told that the property that included Porch House has a long history which could perhaps be traced back to the Berkeley family. We are indebted to the research of Alison Bagnall and others for the information that the building known as Porch House in Castle Street in Thornbury could possibly have been a medieval open hall built in the 1400s by Maurice Berkeley. English Heritage has confirmed that both Porch House and “The Green House” appear to have Fifteenth Century origins. We know that Maurice Berkeley, the third Lord Berkeley, was the brother of William 2nd Baron of Berkeley and according to the website, “thePeerage.com,” he was born in 1436. His wife was Isabel Meade, a widow whom he married in 1465. Isabel also owned land in Thornbury bequeathed to her by her brother Richard. Their son Maurice seems to have been born in Thornbury in 1467. Maurice’s brother William Berkeley was one of the protagonists in the Battle of Nibley Green which was a very long running dispute over the inheritance of Berkeley Castle. William won but only with the help of Maurice and the army of men that he managed to raise, some coming from local families in Thornbury. Maurice was also assisted by his wife Isabel’s father, Philip Meade or Mede, who was from Bristol but who owned land in Thornbury and so was also able to provide men for fighting. There is certainly documentary evidence that Maurice owned various properties in Thornbury and that he lived in the area. However we have not yet seen a definitive link between Maurice and any particular property. It must be remembered that we have not had access to the deeds and that such early documents are unlikely to give a detailed description of a property. One of our few sources on this subject is the Berkeley Manuscripts, by John Smyth (1567-1640) who gives us a charming account of the wife of Maurice Berkeley. “The wife of this lord Maurice was Isabel daughter of Philip Meade Esq. and of Isabel his wife; son of Thomas, son of Thomas Meade, descended of the ancient family of Meads of Meads place in Fayland in the parish of Wraxall near Portbury in the county of Somerset, where anciently they had continued; whom this lord married in the thirtieth year of his age, about eighteen months after his father’s death, she then a widow and mother of three children, who all died very young. At the time of this her second marriage, her father was an alderman of Bristol and at divers times mayor there; and for her dowry, besides her personal estate, she brought to this lord her husband (then a younger brother) divers lands in Somersetshire, and others in Thornbury in Gloucestershire (where this lord then also had other lands both of his own purchase and of the gift of his elder brother) and a lease of the said Meads place for one and twenty years; and was after one of his executors, as his will shows. She was a virtuous lady and evermore content with better or harder fortunes, and what goodness and disposition she was of in her last widowhood, after this lord her husband’s death, may be conceived out of these few relics of her many devotions. The website “thePeerage.com” says that their son Maurice, the fourth Lord Berkeley, lived in Yate rather than Thornbury. He died without legitimate issue in 1523 and his brother Thomas who was born in Thornbury in 1472 became the 5th Lord Berkeley. ‘The Lives of the Berkeleys’ by John Smyth of Nibley gives us an indication of how the properties associated with the Green House Closes changed hands. It seems that in the twentieth year of the reign of Queen Elizabeth 1st, Henry Lord Berkeley sold three houses in Thornbury to John Hilpe (or Hylpe) for the sum of £37 6s 8d. At the time of the sale they were said to be leased to John Tayer for 7s rent ‘for divers years to come’. It was noted that John Hilpe was the great grandchild of Richard Hilpe who had been present at the battle of Nibley Green. We know that Richard Attwells’ will, proved in 1630, says that the property he is leaving to his nephew John Attwells was bought by him from John Hylpe. He describes it as “my house wherein I do now dwell with the rest of my houses and land in Thornbury aforesaid which I purchased of John Hylpe and the use of all the glass and wainscot belonging and adjoining unto my said dwelling house.” At this point we believe that his properties included Porch House. “I do give and bequeath unto my wife Ursula during her natural life my house wherein I do now dwell with the rest of my houses and land in Thornbury aforesaid which I purchased of John Hilpe and the use of of all the glass and wainscot belonging and adjoining unto my said dwelling house during her said natural life so as and upon this condition also that my said wife Ursula or her assigns shall not do or commit any voluntary or wilful waste in or upon the said house or woods standing or growing upon the said land. The Attwells (the name has many spellings, including Attewell or Atwell) family lived in Cromhall in the sixteenth century. A website called prattens.co.uk says that the family came to Gloucestershire from Cheshire by about 1530. Richard’s will also refers to his brother John and John’s wife Agnes and his sister Susan who married Robert Webbe. The main beneficiary of Richard’s houses and land in Thornbury was his wife and after her decease to his brother John’s son, also named John. Richard was buried in Thornbury according to the request made in his will. He also made mention of Cromhall and bequeathed his books to be left in Cromhall Church. At this point we have no information about Richard’s nephew John Attwells other than the facts that Alison Bagnall has told us – that is that John and his wife Edith had four children; Richard, John, Ann and Agnes. Of these the property seems to have been passed to Richard (see below). We have learned from Alison Bagnall that Richard and Mary had three children in all; Ann born 1650, Mary born 1656 and Richard born in 1659. We believe that they may have been living in what is now Porch House in Castle Street. We do not know when Richard died but the Thornbury Rent Roll for 1670 says “the widow Attwell for Latteridge, a burgage, one shilling,” which, if this refers to Mary Attwells, suggests that he had died before 1670. The property subsequently passed to Richard their eldest surviving son. Richard Attwells married Jane the daughter of John Ridley by whom he had three children, Mary born 1688, John born 1689 and Jane 1691. The notes of William A Caffall, an historian who wrote “Thornbury a Study in Gloucestershire History,” contain the fragment of a letter which appears to confirm that Edward and Ann Thurston owned a property called The Green House. The entry says; “In the year 1628 Nicholas Parnell son of Hugh Parnell sold the Green House and Closes to Edward Thurston.” This implies that at this time the Attwells family owned Latteridge but not the Green House and its closes. The notes go on to say that in 1687 Mr Attwells purchased the above of the trustees for the benefit of the creditors of Thomas Thurston. This Mr Attwells was probably Richard the husband of Jane. It means that after 1687 both the Latteridge and the Green House with its Closes, once owned by the Hylpe family, were owned by the Attwells. The Tithe Terrier of 1696 provides the clearest description of the property owned by the Attwells that we have seen so far and makes it clear that Richard Attwells owned both the Green House Closes and Latteridge. We believe that this would include the Green House (Clematis Cottage and The Priory) and The Porch House. “16. Item Two grounds belonging to Mr Richard Attwells called the Green House Closes by estimacion about seaven acres bounded North by the way which leadeth from Kington to Thornbury, East by the Streete of the Burrough of Thornbury and the orchard belonging to the Green House, South by Mr Attwells ground called Latteridge and West by Mr William Greenfields Great Wellfield and Jones’s Little Wellfield. 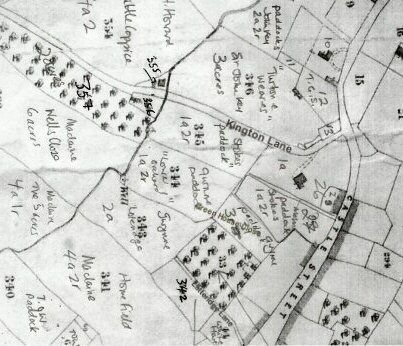 The map above shows the narrow lane that runs from Castle Street (next to what is now Natwest Bank) into the field marked Loteridge (also known as Latteridge). The nine and a half acres of land referred to lie between this field and the road that runs to what is now the cemetery and include Coppins Well. Porch House lies in this area as do Clematis Cottage and The Priory. Richard Attwells died in 1728. His property then passed to his son John Attwells who himself died in 1729/30 aged only 40. He was unmarried and with no surviving siblings. John Attwells has a large and impressive monument in St Mary’s Church in Thornbury in respect of the bequests he left to charitable uses.” One of the “charitable uses” was the establishment of a Free School, for which £500, a very large sum in those days, was given in trust. Attwells directed that a good master and mistress should be placed therein to instruct the children of the parishioners, gratis, in reading, writing, knitting and sewing and all other things necessary for such children. The school was not to be connected with any other school. In addition £200 was to provide an income for the apprenticing of poor boys of the town and another £100, the proceeds of which were to ‘buy one good fat bullock or heifer which should from time to time yearly be given amongst the poor people of the said town on the Feast of the Annunciation’. Attwells’ Free School occupied the building in St. Mary Street, later known as the Church Institute and now as Ronnie’s Restaurant. As John had no children, in his will of 1729 he left his property to the eldest son of his kinsman John Crowther. John Attwell’s aunt Ann Attwells had married John Crowther in 1670. This explains why property in Thornbury owned by John Attwells was left in the first instance to Samuel Crowther the eldest son of John and Ann’s son John and his wife Elizabeth. Samuel died in infancy and in accordance with John Attwells’ will the property passed to Richard Crowther, the next son. After Richard’s death his brother Nathaniel became the heir. After Nathaniel’s death without issue the property eventually passed to John Crowther, the youngest brother. Click here to read more about the Crowther family. The will of John Crowther dated 11th of January 1808 appears to have effectively divided his property between the heirs of his sister Ann Tombes. This is why Ann’s grandsons James and Alexander Smith became the heirs to the part of the property that included Clematis Cottage, The Priory and the closes of land associated with them. We believe that the property that included Latteridge Closes and presumably Porch House became the property of Ann and Richard Gwynn. Ann Gwynn was the daughter of John’s sister Ann Tombes nee Crowther. Click here to read about the other occupants and owners of Porch House.